Most people know what a social networking site is and how it works. You must have updated some information or uploaded a video or some photos on Facebook in order to share them with your friends and family. You may have also made a valuable business contact through LinkedIn. These are some of the uses of a social networking site. However, what exactly is a social networking site and how does it work? How you ever stopped to ask yourself this? Probably not, as all you ever wanted was to log into whatever site is your favorite and start scanning for posts and messages. However, social networking has several key attributes that makes it unique and different from other websites. They have devised their own ways and means to allow people to create avid followers, form communities, and communicate with each other. In the beginning when this concept was mooted for the first time ever, in the 90s, the primary concept was to let people reconnect with people they had already known earlier. Much later, new exciting features like photo sharing was introduced, which made these sites even more popular. The message boards on the Internet facilitated the formation of online communities, which were initially started as a purely social affair with not business intentions whatsoever. Those so-called social sites did not have active friends lists that could be updated or added. Most such sites were devoted to one particular form of recreational activity like listening to a particular genre of music. These sites allowed users to keep a track of the latest and allowed them to rate the songs their own way. Today’s social networking site has some distinct features. Whether it is Facebook, LinkedIn or Twitter, they all allow the users to create their own domains or profile pages, something that they guard with fierce privacy and sense of ownership. They are allowed to post any personal information about themselves, knowing pretty well that it is open to be viewed by their friends and friends of friends and so one. This sort of chain linking is what helped sites like Facebook attain incredible membership bases exceeding 1 billion in number. This ability of users to link with their friends and family and view each others’ profiles is what is standing in good stead and contributing to the immense popularity of the sites. BuddyPress, the social networking package with an open source is a plugin. 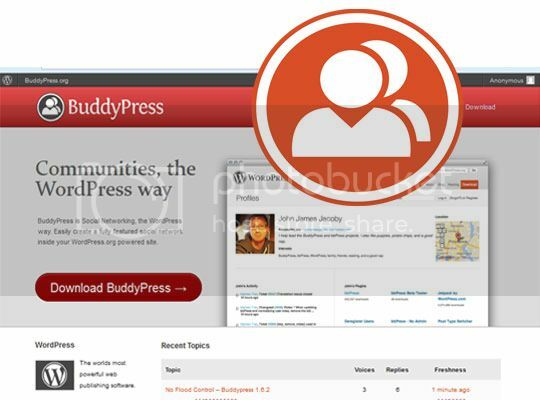 You can use BuddyPress to create your own social network using WordPress. The language it is written in is PHP and MySQL and it has several features that are unique. User profiles allows the users to create their own profiles and have the page to themselves, though the details can be viewed by their friends, who in turn may share the information with their friends if you so allow it. The activity streams are devoted to all sorts of activities and let you create communities based on the activities. The avatar uploads lets you upload your favorite photos and videos that can be shared with friends and family. BuddyPress also lets you create your own forums and invite like-minded people to join the discussions. Group creation is permitted where people from small communities that have common interests ranging from music to wildlife to nature. The friend system allows you to invite and add friends to your existing list, with no limits to the number of friends a person can have. You do not need to have any experience in programming as you can make use of the many plugins that are available. Plugins like BuddyPress Followers helps followers make connections without the fear of being rejected, as there is no need to get a confirmation. BuddyPress Portfolio allows people to create their own portfolios within the group. A great way to highlight their specialties and share their work details. BP Resume Page enables online resume capabilities and allows profiles on BuddyPress to create a resume that provides details of their line of work, experience and list of skills. BuddyPress Activity Plus is a plugin that allows users to upload videos, photos and links to any of their other sites. This helps professionals and businesspersons share and exchange vital information for mutual benefit. BuddyStream is the best plugin for sharing content on the site. It allows you to sync the other social network sites with BuddyPress, which gives access to a lot more users. BP BookMarklet is a plugin that allows you to share content from any other website on BuddyPress sites. I didnt get it through.. did buddypress allows you to make your own social networking site or it make a a member like fb or twitter..please elaborate….